On Nov 17th, just 4 months after Sarah Palin announced she was stepping down as governor of Alaska, her book will be in stores. Every ‘Joe Six Pack’, ‘Maverick’ and ‘Main Street’ American will find out if 400 pages of easy to understand one-liners can make an interesting book. Palin has been on my $hi&? *; list for a long time but peaked on it back in August when she made some very public speeches claiming that the new health care reform contained ‘Death Panels’ (see ABC’s fact check of the story here). 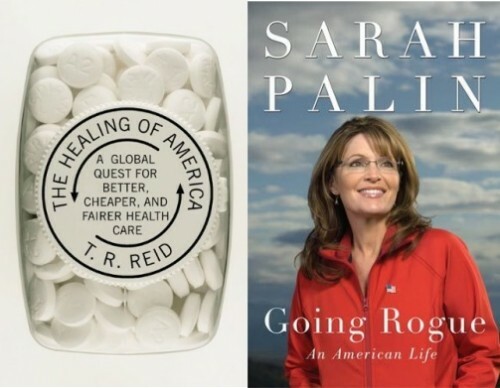 Early reviews of her book indicate that book contains many more falsehoods (Yahoo!). So she may be pretty, easy to understand, and charming, but the woman lies and uses fear to win her arguments. That’s why I am not supporting her book and why she makes my burn list. Side note: check out the first definition listed for ‘Rogue’ under dictionary.com. ’nuff said. *Daemon’s Books does not actually believe in burning books. That pretty much goes against everything we believe in. It’s just a joke, so calm down. Sheesh!